I had a glimpse of Summerland when I was at the Local Lounge & Grille dinner at the Greenhouse. Everyone seemed to know each other and acted as if they had known me just as long. The welcoming was most definitely a sign of things to come in that town. We got up early and headed out of the Ramada Inn Penticton for the short ride to Summerland. With a day starting in a place called “Good Omen,” we had a good feeling. 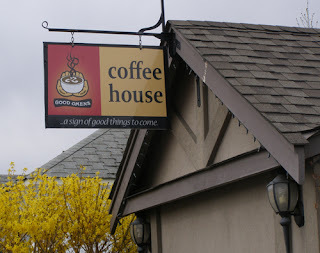 That is the name of the coffee house that Lisa Jaager, General Manager of the Summerland Chamber of Commerce, met us at. 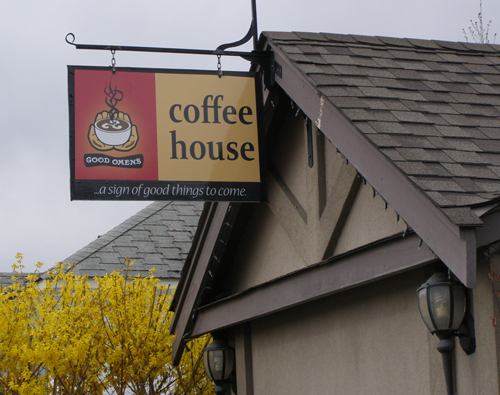 Susan had the Pour Over, a freshly made cup of an Ethiopian Blend that Good Omen is known for. I enjoyed my usual non-fat latte (with cinnamon) and a great cinnamon roll that wasn’t too sweet or sticky. 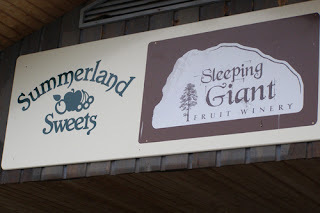 We chatted for awhile about Summerland before heading to Vinegar Works at Valentine Farm. 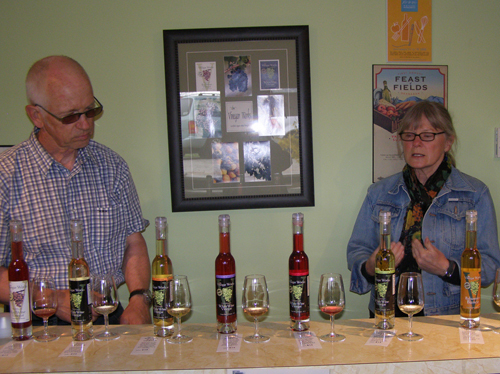 Valentine Farm has everything from vineyards to horses, but John Gordon and Kim Stansfield are best known for their vinegar. The couple has owned 10 acres here since the late 1990s. 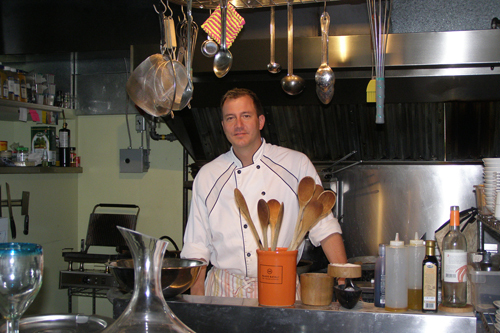 They have kept it going with green practices and focusing their production on some very tasty vinegars. My favorites were: Balsomico Rosso, a fruity balsamic style; Raspberry Infused, filled with lots of the red fruit; and Tarragon, an herby blend that would be delicious on everything from potatoes to chicken. 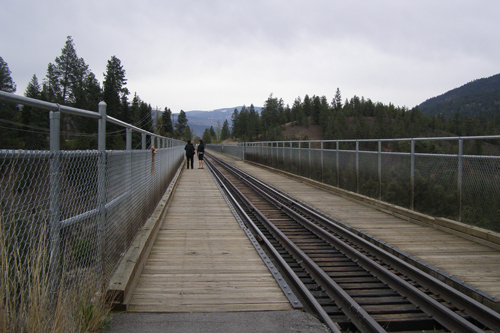 We stopped at the Kettle Valley Railroad Trestle, where you can catch some great views of the valley, before driving to Summerland Sweets and Sleeping Giant Vineyard. If it’s made from fruit, chances are you can find it here. I was a little taken back by the Pumpkin Wine, but I have to admit the mix of nutmeg, cinnamon and cloves left my palate ready for a turkey dinner. The syrups were great for dessert, pancakes – or the ice cream we were provided. I think the Apple Pie was my favorite, but I also loved all of the berry syrups. One of my favorite things about Summerland was the Bead Trails. It is a unique way to get to know this town -- and come home with more than memories. Nearly two dozen businesses, from wineries to art galleries, participate in the Summerland Bead Trail. Each location sells the starter bracelet and a charm that represents their place. The Chamber generously got Susan and I bracelets and we collected charms along the way. Each one is representative of the place, like a coffee cup for Good Omen and a circle of hearts for Valentine Farm. I picked up my last bead of the day (an olive branch) at Victoria Road Deli & Bistro, where owner/chef Roger Gillespie was waiting for us with an excellent starter sampler of a Goat Cheese Risotto with Peas and a Fettuccine with Duck Ham that was incredible. My Turkey Panini with Asparagus and melted cheese was also delicious, and Susan loved the Wild Salmon. This restaurant, which is about to celebrate its third anniversary is a must for a good feeling of this quaint town while enjoying great food, as well as local music on the weekends. Susan and I drove back to where our Okanagan Valley trip began. Kelowna was just on the other side of the lake, but we had seen (and tasted) so much in between. It was time to catch a plane, but I wasn’t going home yet. I was off to San Diego, where I am picking up my Celebrity Wine Cruise. Victoria and Vancouver are scheduled stops so I will get to return to British Columbia at the end of next week. The Pacific Northwest was really calling me this year! I’m spending a good part of my spring exploring this beautiful area and tasting its wine so stay tuned. First it was Washington, then this trip to British Columbia, Canada. I’m now off to a Pacific Coastal Wine Cruise on the Celebrity Millennium. 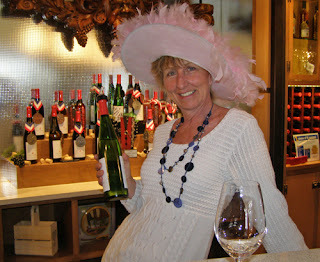 I will be checking out the wine of each region on and off the ship, as well as doing some interesting and unusual tours. Stay tuned for upcoming coverage of Catalina Island, Napa and Sonoma, California; Portland, Oregon; Seattle, Washington; Victoria, BC, Canada; and Vancouver, BC, Canada. And, I get to bring along another friend… plenty more fun to come!